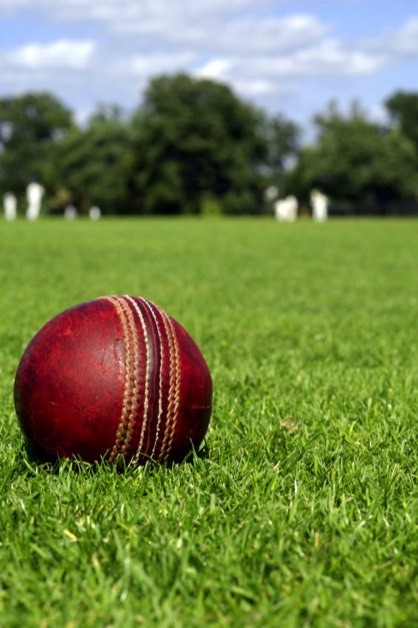 Swyncombe Cricket Club is located in Cookley Green, a picturesque hamlet situated on top of the Chiltern Hills. The road from Watlington to Nettlebed dissects the green with its brick and flint houses to the north and south side acting as boundary markers for the original cricket ground. It is hard to imagine that cricket matches were once played on the green as you drive along the tree lined avenue. One can only imagine that the traffic along the B4009 was a little lighter in years gone by, as we might have lost considerable numbers of fielders. If you have any other stories or photo’s from years gone by we would love to see them. Just click the email button to let us know. 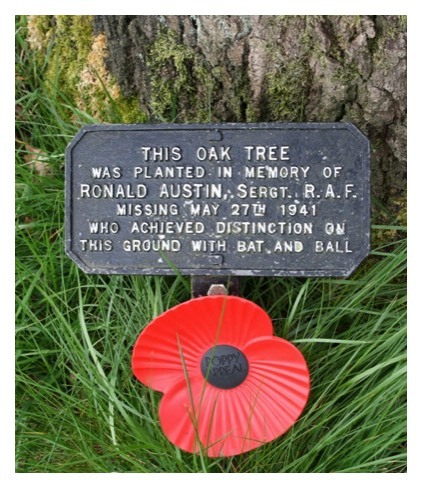 At the base of the Oak tree to the right of the Pavilion is a small plaque "....in memory of Ronald Austin, Sergt RAF - missing May 27th 1941 who achieved distinction with bat and ball on this ground". Unlike many of the Swyncombe Crickers at the time, Ron Austin was "a suit" says Dorothy Ackerman. Meaning he worked in an office rather than on a farm. He lived at 1 Coates Lane. He was a Wireless Operator/Air Gunner or "WOP AG", as they were known as in the RAF, and their "half wing" brevets had the initials WAG. Ronald served on 82 Squadron based at Watton in Norfolk, flying the Blenheim Mk IV light bomber. Between May 1941 & March 1942 some of the squadron were detached to Malta. A number of aircraft were lost en-route, but the ones that made it were used in low-level attacks in the Mediterranean on enemy shipping which was sailing between Italian ports and North Africa, keeping Rommel's Afrika Corps supplied. On 27th May 1941 three Blenheim aircraft from 82 Sqn attacked an enemy convoy, but unfortunately their bombs had been fitted with instantaneous fuses rather than delayed action. The bombs exploded immediately on leaving the aircraft which severely damaged the aircraft and brought 2 of them down into the sea. It seems that the 3rd a/c realised what was happening and did not drop its bombs. Ron Austin was killed together with the pilot, but the navigator, Sgt Collins, was the only survivor of the attack and was picked-up out of the sea by an Italian destroyer though very badly injured loosing a leg, & becoming a PoW. He was later repatriated in 1943 under the auspices of the Red Cross via Portugal. A picture exists of the moment that he was handed over to the Portuguese. Though there are 17 names on the Cookley Green War memorial relating to WW1, Ron J Austin and Jack H Barnett are the only 2 names from WW2 - both from the RAF. Barnett was killed in an aircraft accident on 19th October 1942 at Inverness airfield (Dalcross) while still under training as an air gunner. His remains were returned to his family at Swyncombe and buried in St Botolph's churchyard in a civilian grave. About 20 years ago the Commonwealth War Graves Commission noted that his gravestone inscription was illegible and offered to erect a standard CWGC gravestone. This offer was accepted, and both the original low rectangular curbstone type gravemarker and the white War Graves commission stone can be seen in the churchyard together just to the east of the church. A happy ending to an otherwise sad story, was that the lady with whom Jack Barnett was "walking-out" at the time of his death stayed in contact with his family after his death, and sometime later met his elder brother who was in the Grenadier Guards and had been wounded at Salerno during the Italian campaign and was convalescing at his parents' home at Swyncombe. They subsequently married and had 50+ years together, and 2 daughters. Thank you to John Scullard who kindly contributed to the History page.